Slavisa Jokanovic expressed his disappointment at an "ugly" comment made in the aftermath of the incident that left Lucas Piazon with a suspected broken leg during Fulham's goalless draw at Leeds. 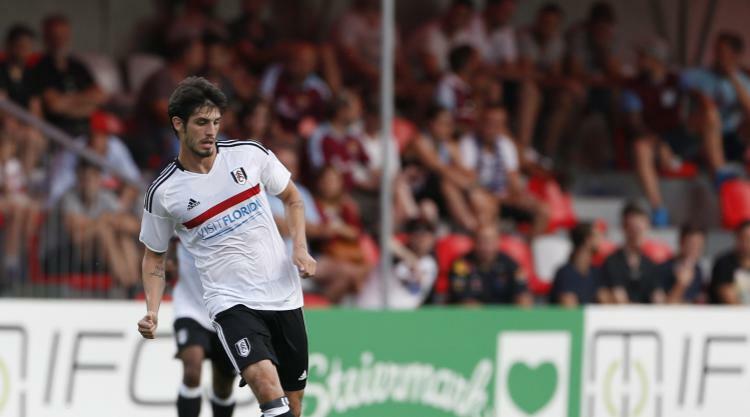 The Brazilian striker rejoined Fulham on a season-long loan from Chelsea this summer but is now facing a lengthy spell on the sidelines after he was carried off in the first half following a challenge by Conor Shaughnessy. "It's a very bad injury and we will lose him for a long time," said Fulham boss Jokanovic. "It's not a question about complaining - it can be bad luck or a tackle outside of the normal - but I'm really disappointed with what I heard from one of the referees who explained, 'This is English football and this is completely legal'. "I am a 48-year-old man and I've never heard an ugly answer like I heard today in this stadium. "We are so disappointed for this situation about Lucas Piazon. I believe he broke the fibula or broke the leg." When asked to clarify who he was referring to, Jokanovic answered: "I don't see so well. "I'm a little bit disappointed that I hear around me something so ugly." Last season's play-off semi-finalists dominated large parts of the first half but were forced to settle for a third successive draw after Leeds grew into the game. "We showed different faces," said Jokanovic. "We opened the game very well and created chances but they pressed us better at the start of the second half and the result was fair at the end. "It's positive that we haven't lost any games but it's a bad thing we haven't won any games in the start of the season." Leeds also remain unbeaten under new boss Thomas Christiansen but had chances to take all three points against the side that stole their top-six place in the final month of last season. Chris Wood, the Sky Bet Championship's top goalscorer in 2016/17, endured another frustrating game in front of goal amid reported interest from Burnley. "I don't know about the bid," said Christiansen. "I'm not listening to it. "I'm just focusing on Chris on the pitch to score the goals. We'll work on that." It was a second successive 0-0 draw for Leeds in front of their own fans after netting seven goals in their opening two games. "It's another clean sheet and I believe the team played a very good game," said Christiansen. "We have to recognise that we played against one of the best teams in this league. They started very well and we were not fast enough. "At the end of the first half we controlled the game a bit more and in the second we deserved more. "We need to be a bit more dangerous up front but at the end I'm satisfied with that result."